Having just reviewed their “Beer Bloodbath” EP, I was anxious to hear the newest full length from the mighty Incursed from Spain. It was obvious that there was a definite progression from the first full length (“Fimbulwinter”) just after hearing the couple of new songs from the EP. Sometimes progression can be a bad thing where some bands take too much of a musical step away from what got them to the next phase and thus turning away some fans. 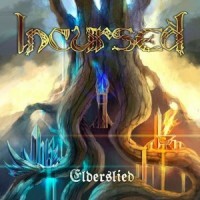 Incursed have done it the way every band should…..progression musically but also enough of the original sound so that there is a nice blend of the old and new. I am not saying they have changed their sound but augmented it to give the listener even more to sink their teeth into. The most apparent differences to me are definitely more of a tenor/clean style vocal which made some appearances on the first album but are used more here as well as I would say a less folkier sound overall. If I had to give you a musical compass to go by, I would say they remind me of Nightcreepers (France), Nothgard (Germany), Myrkvar (Netherlands)and even some “Nexus Polaris”-era Covenant (Norway) so still a folky base with the addition of some more progressive and trashiness to their sound. Songs like “The Wild Hunt”, “Tidal Waves” and “Lady Frost” will sound like they could have been on the first album, with the same vocal delivery, riffing style and song structure while songs like “Heart of Yggdrasil”, “Raging Wyverns” and the epic 10+ minute “One Among A Million” show the growth and maturity in song writing and musicianship. Production wise the album really highlights the guitar work which seems to now really be pushing them forward, as opposed to be blended in on the first album….a definite bonus but may seem to overshadow their folk/Viking/pagan roots a bit. My advice would be to listen to the first album and then take a listen to Elderslied…..you will then hear how they have advanced without turning their back on what got them to where they are now. Luckily for us Incursed are taking us all along on their musical journey…..a great album.